Learn the history and the growth of the power sector in India (also applicable to other developed countries). Obtain an overview of the existing situation of power generation, transmission, distribution, and consumption patterns. Acquaint with Electricity Act 2003 and Electricity Act 2007 and their objectives. Understand restructuring of the power sector and its importance in the Indian context. Identify various systems and sub-systems of a power network, including categorization of various types of conventional (hydro, thermal, nuclear) and non-conventional (solar, wind, tidal, magnetohydrodynamic) primary sources of energy. Know the significance of computers in online control for the efficient management of power systems and reliable supply of electrical energy. Electrical power is the most convenient form of energy since it is available to the consumer at the very instant it is switched on. The other benefits of electrical energy are the ease with which it can be generated in bulk and transmitted efficiently and economically over long distances. The first electric supply system was introduced by Thomas Edison in 1882 at the Pearl Street Station in New York, USA. Power was generated in a steam engine driven DC dynamo (generator), and DC power was distributed through underground cables for lighting purposes only. The scope of distribution was limited to short distances because of the low voltage of the distribution circuits. In pre-independent India, the generation of electric power was mainly undertaken by the private sector and was limited to urban areas. The development of the power sector commenced with the commissioning of a 130-kW generator, in 1897, at Sidrapong in Darjeeling. In 1899, The Calcutta Electric Supply Company (CESC) established the first 1000-kW steam engine driven plant in Calcutta. Post-Independence, the Government of India (GOI) took upon itself the task of developing the power sector in a rationalized manner so as to expand the electric supply industry for the benefit of the entire country. The early 1950s, therefore, saw the setting up of state electricity boards for the systematic growth of the power sector. Side by side a number of multi-purpose hydroelectric schemes were also commenced. In due course of time, work was started on building hydro, thermal, and nuclear power generating stations. In 1975, the GOI set up the National Hydroelectric Power Corporation (NHPC) and the National Thermal Power Corporation (NTPC) to signal their participation in the generation programs and provide a stimulus to the growth of the power industry. Subsequently, Nuclear Power Corporation of India Limited (NPCIL) and Power Grid Corporation of India Limited (PGCIL) were established to provide an additional fillip to the power sector. Starting with an installed capacity of 1,713 MW at the end of 1950, installed capacity is being continually enhanced to meet the growing demand for power. As per the Central Electricity Authority (CEA) Monthly Power Sector Report (December 2012), the total installed generation capacity, constituting of hydro, thermal (including steam, gas, diesel), nuclear, and renewable energy sources (RES), as on 31 December 2012, stood at 210951.72 MW. The breakdown of installed capacity of different types of plants is given in TABLE 1. By the end of the 12th Five Year Plan (2012-17), an additional total generation capacity of 79,790 MW (out of which hydro [9,204 MW], nuclear [2,800 MW], and thermal [67,786 MW]) is envisaged. The gross electricity generation at the national level, not considering the generation from the captive plants, grew from 5107 GWh in 1950 to 5,65,102 GWh during the second year of the tenth plan (fiscal year 2003-04). The electric energy generation target for the year 2011-12 was 8,55,000 GWh. Actual electric energy generation during the year was 8,76,400 GWh, and the growth in generation during 2011-12 was 8.05%. The details of generation and growth rates are given in TABLE 2. Table 2 Annual electric energy generation targets and achievement. * Generation excludes generation from plants up to 25 MW capacity. The Central Electricity Authority Load Generation Balance Report 2012-13 predicted the anticipated power supply position in the country during the year 2012-13, taking into consideration the power availability from various stations in operation, fuel availability, and anticipated water availability at hydroelectric stations. A capacity addition of 17,956 MW during the year 2012-13 (comprising 15,154 MW of thermal, 802 MW of hydro, and 2,000 MW nuclear power stations) was envisaged. The gross energy generation in the country was assessed to be 9,30,000 GWh from the power plants in operation and those expected to be commissioned during the year. As is expected for a nation on the move, the consumption of electricity increased from year to year. The electricity consumption stood at 4,157 GWh by the end of 1950; it had increased to 3,22,459 GWh during the last year of the ninth five- year plan; and by the end of the second year (2003-04) of the tenth year plan, the electricity consumption registered was 3,60,937 GWh; an increase of 12% over the last two years. In 2009, the electricity consumption figure stood at 6,000,000 GWh which is expected to double by the next decade. The major consumers of electricity are: industrial sector (34.51%), domestic sector (24.86%), and agriculture sector (24.13%). As a first step towards improving the quality of life in rural India, it was essential to undertake electrification of the villages. As per the report on the Status of Rural Electrification as on 31 March 2011, brought out by the Ministry of Power, Government of India, the number of villages electrified stood at 4,39,502, which represents a coverage of 74.02% of the villages, as against the 3061 villages electrified as on 3 1 March 195 1. Based on the 1991 census data, 17 states/Union Territories have achieved 100% electrification of the villages. The details of rural electrification as on 31 March 2011 are presented in TABLE 3. At the end of the second year of the tenth five-year plan, that is, 31 March 2004, the total length of the transmission and distribution lines stood at 63,44,858 circuit kilometers (ckm) as against 29,271 ckm on 31 March 1950. 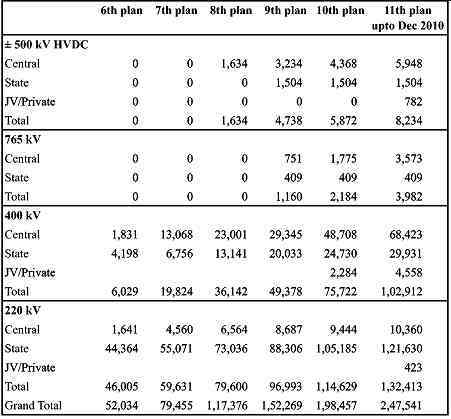 TABLE 4 provides the details of operating voltages and line lengths of transmission lines during the development of Indian transmission and distribution system through the five year plans. The Government of India plans to quadruple the distribution network by adding 3.2 million ckm of distribution lines in the eleventh plan. Another 4.2 million ckm is planned to be added in the twelfth plan. Thus, by the end of the twelfth plan, the total distribution network in the country would have doubled, thereby greatly facilitating delivery of power to the expanding base of end-use customers. TABLE 5 indicates the details of the requirements of distribution network in the 11th and 12th plan periods as envisaged by the Working Group on Power for the 11th plan. The per capita electricity consumption, which is an indicator of the development of a-country, has been steadily increasing since 1950. For example, in 1950 this figure stood at 15.6 kwh, which increased to 559 kwh during the last year of the ninth five-year plan 2001-02. During the year 2003-04, the second year of the tenth plan, the per capita electricity consumption rose to 592 kWh. 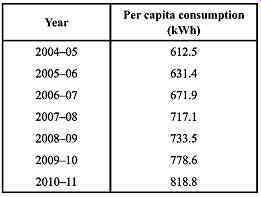 As per the highlights reported by the Central Electricity Authority, annual per capita consumption of electricity in the country during the years 2004-05 to 2010-1 1 is provided in TABLE 6. TABLE 6 Annual per capita consumption of electricity. Achieving the objective of electrifying all households by the target year requires an addition of a massive 1,00,000 MW generation capacity and amalgamation of the regional grids into a national grid, with the latter having an inter-regional transfer capacity of 30,000 MW. Therefore, in order to achieve the above objective, additional generating capacity should be created and the transmission and distributions networks should be enhanced. The following strategies to achieve 'Power for All' have been outlined for developing the power sector: Power generation strategy will focus on an integrated approach including low cost generation, optimization of capacity utilization, controlling the input cost, optimization of fuel mix, technology upgradation, capacity addition through nuclear and non-conventional energy sources, high priority for development of hydro power, and a comprehensive project monitoring and control system. Transmission strategy focuses on development of a National Grid including interstate connections, technology upgradation and optimization of transmission cost. Distribution strategy is to concentrate on distribution reforms by focusing on system upgradation, loss reduction, theft control, consumer service orientation, quality power supply commercialization, decentralized distributed generation, and supply for rural areas. Regulation strategy aims at protecting consumer interests and making the sector commercially viable. Financial strategy aims at generating resources required for the growth of the power sector. Conservation strategy is to optimize electricity utilization with focus on demand side management and load management and technology upgradation to provide energy efficient equipment/gadgets. Communication strategy focuses on achieving political consensus, with media support, to enhance general public awareness. The Vision 2020 committee set up by the Planning Commission in June 2000 envisages efficient and environment-friendly energy resources which would become the growth engines to provide speedy and sustainable future economic development. In order to power the country's industries, transport vehicles, homes, and offices, the demand for power is estimated to grow by another 3.5 times or more in the next two decades. This, in turn, will require that the installed generation capacity be compulsorily tripled from 101,000 MW to 292,000 MW. Such an overall growth in power demand will need a matching supply of all forms of fuels leading to a doubling of the coal demand and tripling of the demand for both oil and gas. Such swelling demands for the nation's growing requirements of energy will further strain the social and physical environments, in addition to increasing vulnerability due to fluctuating international market prices. In today's energy scenario, it would be prudent to take a focused visionary approach to place greater dependence on renewable energy sources, which not only offer immense economic benefits but also offer social and environmental benefits. With India already being the fifth largest wind power generating country in the world, use of other renewable energy technologies such as solar power, solar thermal, biomass, and small hydro power is being explored. Development of the power sector continues to be one of the greatest challenges in maintaining economic growth and further reducing poverty in India. About 45% of the households remain unconnected to the public power system, and those who are connected often receive infrequent and unreliable service. The State Electricity Boards (SEBs) have been incurring losses and are unable to even make payments to the Central Power Sector Units (CPSUs) such as NTPC and PGCIL for the purchase of power. The accumulation of outstanding amounts to the CPSUs grew to over 40,000 crore, seriously hampering their capacity addition program. The reform of the power sector is crucial, as financial losses amount to 1.5% of the GDP. To strengthen the financial health of the power sector, the GOI has taken up reforms for gradual elimination of losses. In India, the power sector reform process was initiated in 1991 and since then the Indian power sector has been witnessing major structural changes. During the year 2003-04, the following decisions were taken for achieving the objectives of 'Power for All'. Electricity Act 2003 was enacted in July 2003. Accelerated electrification program for 1,000,000 villages and one crore rural households launched. The scheme outlay oft 6,000 crore comprised a grant component oft 2,400 crore. 50,000 MW hydro initiative launched. Improvement in power supply position: Since the beginning of the ninth five- year plan (1996-97), the peak shortfall had reduced from 18% to about 11%. Supply shortfall had also reduced from 11.5% to 7.1%. Generation performance: During 2003-04, the generation, compared to the previous year, improved from 53 1 billion units (BU) to 558 BU (1 billion = 10^9). Overall plant load factor (PLF) of generating stations improved from 72.2% to 72.7% while in the central sector it improved from 77.1% to 78.7%. Capacity addition target and achievement Uninterrupted and reliable supply of electricity for 24 hours a day needs to become a reality for the whole country including rural areas. In order to fully meet the energy and peak demand by 2012, enough generating capacity has to be created with some spare generating capacity so that the system is also reliable. The sector is to be made financially healthy so that the state government finances are not burdened by the losses in this sector. The sector should be able to attract funds from the capital markets without government support. The consumer is paramount and he/she should be served well with good quality electricity at reasonable rates. To ensure grid security, quality, and reliability of power supply, a reasonable spinning reserve at the national level has to be created in addition to enhancing the overall availability of installed capacity to 85%. A capacity of about 1,000,000 MW is planned to be set up during the tenth and eleventh five-year plans, that is, between 2002 and 2012. This implies doubling the installed capacity which works out to adding about 430 MW every fortnight! Capacity addition plan for addition of 41,110 MW has been finalized for the tenth plan period. The central, state, and private sector's share of the capacity addition is expected to be 51%, 16%, and 25% respectively. About 7% is expected to come from renewable sources and 2% from the Tala project in Bhutan. A hydro power initiative has also been launched by the Prime Minister in 2003, under which a capacity of 50,000 MW is to be added in the same period, that is, 2002 to 2012. Outlay for power sector for the tenth plan period has been enhanced to t 1,43,399 crore, an increase of approximately 214% over the ninth plan outlay of 345,591 crore. Advance action plan has also been initiated to identify the capacity addition required in the eleventh plan. In the last two plan periods, barely half of the planned capacity addition was achieved. The optimistic expectations from the Investments in Power Projects (IPPs) have not been fulfilled and, in retrospect, it appears that the approach of inviting investments on the basis of government guarantees was perhaps not the best way. The Act, however, permits the state electricity boards to operate, for a limited period, with their integrated structure and allows them to select the order and segments of restructuring. The Electricity Bill 2003 passed by the Parliament in May 2003 is a unified central legislation and replaces the earlier three electricity Acts of 1910, 1948, and 1998 along with their amendments. The term 'elimination' has been omitted in relation to cross-subsidies. Captive units will not require a license to supply power to any user. Strict action against unauthorized usage of power. Power theft has been recognized as a criminal offence, punishable under Section 173 of the Code of Criminal Procedure, 1973. It would be appropriate to develop the concepts associated with regulation and deregulation, in respect of the power sector in India, before describing the concepts of restructuring. Regulation of the power sector implies that it must function within the laws and regulations which have been specified by the government. Deregulation of the power sector implies that the government has specified rules and economic enticements for restructuring, controlling, and driving the electrical power sector. Clearly, a regulated power sector means that it functions in a monopolistic and risk-free environment. On the other hand, in a deregulated scenario, the power sector operates in a competitive environment and is subject to market risks. Thus, regulation and deregulation symbolize opposite concepts without any one of them being absolutely black or white. Monopolistic--There is only a single authority to generate, transmit, distribute, and sell electrical energy. Responsibility to supply--The authority is obliged to supply energy to all areas irrespective of viability and profitability. (b) the government decides the rates to be charged by the authority. The authority is expected to function within the government's specified regulatory guidelines and practices and it is assured a reasonable return on its investments. The electrical power sector in India, until recently, has been vertically integrated, with all the functions of power generation, transmission, and distribution being performed by a single entity, which complicated the separation of costs attributed to the three activities. Therefore, the electricity tariff rate charged to consumers is based on cumulative costs. From the foregoing, the structure of a regulated authority may be conceptualized as one in which (i) information flow is present between the generating and transmission systems only, and (ii) the direction of flow of money is from bottom to top only, that is, from consumers to the authority. Unlike the regulated power sector, a deregulated power sector is characterized by a competitive structure in which the various job functions, in a traditional set-up, are identified and segregated so that these job functions, whenever practical, can be thrown open to competition for improving efficiency and profitability. The procedure of restructuring is called unbundling. Generally, the objective of the government in deregulating the power sector is to induce competition, by allowing several new players, in the production of electrical energy (generation) and retail marketing (distribution) of electricity, while maintaining a single transmission and distribution system in an area. FIG. 1 presents a conceptual perspective of a deregulated power sector. As can be observed from the figure, an unbundled power sector permits the entry of various players to undertake different tasks. In order to ensure smooth and uninterrupted functioning, a central operating authority, designated as Self- governing System Administrator (SSA) or Independent System Operator (ISO), is appointed for the entire system. The SSA is an independent authority. It does not possess its own generation facilities for business or indulge itself in market competition. The SSA ensures that there is a balance between generation and imports on one hand and consumption and exports on the other, at all times. In the deregulated model, the flow of energy is from the generating stations to the consumers, via the transmission and distribution system as in the regulated power sector. In terms of the functioning of the deregulated power sector, one model is that various generating companies will sell and deliver power via the transmission and distribution (T&D) system to the distributors. The consumer transacts with the distributors. Another practice is that the consumer transacts directly with the generating company. The T&D system is operated by the SSA. From the perspective of information flow, the consumer generally communicates with the distributor and the generating companies while T&D authorities and the distributors communicate with the SSA. In the model shown in FIG. 1, money flow is from the consumer to the distributor, generating companies, and T&D companies. Money is also exchanged between the SSA and the generating and T&D companies. The generating companies pay to the T&D authority for using their facility for supplying energy to the consumer. There is, however, no money flow between the distributor and the SSA. Functionally, the consumer places a demand for energy with the distributor who in turn buys power from the generating company and transfers it to the customer via the regulated T&D system which is operated by the independent SSA. The SSA is accountable for maintaining a liaison with the various players and keeping track of the transactions being enacted. Owing to the various players in the deregulated structure, the energy bill gets segregated into various amounts to be paid towards generation, transmission, and other costs. This is in contrast to the single energy bill in the regulated power sector. The different heads under which an energy bill gets segregated into, in the deregulated scenario, are as follows. Price of energy delivered: This is analogous to the price of transportation of goods from one station to another. Price of quality of energy supplied: The quality of energy supplied is deter- mined by the extent to which frequency is regulated and the voltage magnitude is controlled at the consumers' end. These services are individually priced and charged. The price for these services, however, may or may not be indicated in the energy bill separately. It is clear from the foregoing that a deregulated power sector comprises various participants. Although the designation of the various participants and the role played by each in a market-driven deregulated power sector cannot be clearly specified, yet the next section broadly delineates the various players. FIG. 2 provides an example of an indicative segregation of participants in a market-driven power sector. Generating company (Genco) Genco is a company which owns and operates generating stations to produce electrical power. The bulk energy produced by a Genco is sold at its site which is similar to a petroleum company selling bulk crude at its site. Transmission company (Transco)--The role of a Transco is to transfer bulk power generated at the site of a Genco to where it is to be delivered. In respect of ownership, management, and maintenance of transmission lines, one of the following methodologies may be adopted in a deregulated power sector. Normally, Transco owns and maintains the transmission lines under monopoly contract. The operation of the transmission lines is undertaken by the SSA/ ISO. Since Transco is the sole franchisee of the transmission lines, it is paid for by the SSA/ISO for the use of the facility. Transco may also be assigned the administrative responsibility of carrying out the engineering functions to ensure that the transmission lines perform the task of transmitting power adequately. Distribution company (Disco) -- Disco performs the function of power delivery to individual consumers consisting of business houses, commercial organizations, and domestic customers. Disco is also an owner-operated organization under monopolistic contract. There are two models in which a Disco can function. In the first model, Disco owns and controls the distribution network and it earns its income by renting out the same or by billing for delivery of electric energy. 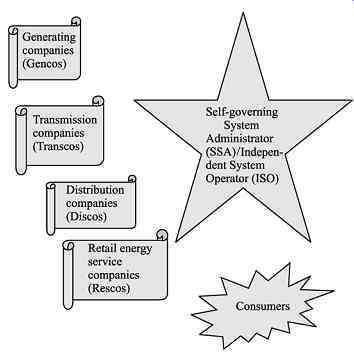 In the second model, a Disco buys power in bulk either directly from a Genco or from the spot (stock) market and delivers it to the consumers. Retail energy service company (Resco) Rescos can be carved out of the several retail departments of the earlier vertically integrated utilities or these could be new entrants in the electrical power industry who believe that they are competent in the art of selling. The job of a Resco is to vend electrical power, that is, buy power from Gencos and sell it directly to the consumers. Self-governing System Administrator (SSA)/Independent System Operator (ISO) -- An SSA/ISO is an independent authority whose role is to ensure reliable and secure electrical power system. It does not involve itself in the electricity market trade. However, in order to ensure security and reliability of the electrical power supply, an SSNISO obtains various services such as reactive power and supply of emergency reserves from different players in the system. Normally, an SSNISO does not possess any generation capacity, apart from reserve capacity, in some cases. Consumers In the deregulated environment, consumers are categorized as a single entity and are perceived as the buyers. A consumer has the option to purchase electrical energy from a local Disco, or directly from a Genco, or from the spot (stock) market by bidding. One of the basic objectives of deregulation is to promote competition within the electrical power industry. FIG. 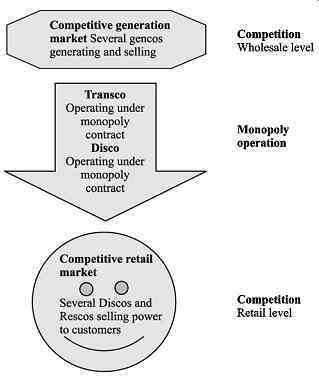 3 symbolically explains how the mechanism of competition is created in the electrical power industry. In a deregulated electric power industry, competition is at the generation level and at the retail market level. Companies (Gencos) generate bulk power and put it on the market for sale at the wholesale level. Typically, customers who buy power in bulk from Gencos are large industrial consumers or other companies. For maximizing their profits, Gencos offer their power in the marketplace. At the retail market level, distribution companies (Discos) buy power in bulk from Gencos and sell the same to individual customers, in small quantities, as per the requirement of the latter. Rescos and Discos compete for increasing their consumer base by offering competitive prices, good services, and other attractive service features. A deregulated electrical power sector, therefore, is competitive at the wholesale and retail levels and in between is the monopolistic transmission and delivery system. It is logical to expect that there exists (i) a marketplace for the sellers and buyers to trade, and (ii) an adequate system for transportation and distribution. Similarly, in the context of a deregulated power industry, the following two additional systems are essential. Power market--A methodology for the bulk power producers (Gencos) to sell and Rescos and Discos to buy power. System operation--A viable transmission system, on real-time basis, which will transport power from the sellers' (Genco) site to the consumers' site. The cornerstone of a deregulated power industry is a level playing field to all the entities. System operation is satisfactorily achieved by Transcos and Discos, which are regulated by an independent mechanism. The concept of a power market was both novel and alien to the power industry and required the introduction of new players. Poolco--It is the single government or semi-government buyer which also functions as the system operator. Its job is to buy power for all consumers. It operates by inviting bids from all Gencos and buying power, at the lowest quoted price, to meet the total demand. Bilateral exchange--It functions on a multi-seller and multi-buyer approach. In this, bilateral agreements are reached confidentially, between a seller and a buyer, to exchange power at a mutually agreed price. Power exchange (PX)--It is a trading exchange for electrical power, very similar to the monetary stock exchange, and is established by the government. In this mechanism, business is transacted through the PX. Similar to a monetary stock exchange, the PX constantly revises and declares the current price, called the market clearing price WCP), at which transactions are done. A feature of the PX is that both the sellers and the buyers are really 'conversing' with the PX (marketplace) instead of individual sellers and buyers and thus are not aware of whom they are dealing with. It may be mentioned that none of the three market instruments are mutually exclusive. It is not impossible to have several combinations of all three market devices to be operative at the same time. In practice, however, it is prudent for two of the three devices to be in operation concurrently. The SSMSO is the key to the successful operation of a deregulated power industry. It must function transparently to ensure a secure and reliable system, justifiable and impartial transmission tariffs, and provide other services. The SSNISO is expected to perform the following basic functions: Deliver power on request to the sellers and buyers, and to transmission services for the transportation of power. Determine and post prices for transmission usage, offer to reserve or sell track usage, invoice users and settle the same with the users, and promptly pass on revenues to owners of T&D system owners. Operate the system in a stable and economical mode. Assure and provide high quality of service. Provide ancillary services such as generation load balance control area, respond quickly to correct generation load imbalances by utilizing spinning reserve, maintain system voltages within specified limits by injecting or absorbing reactive power, and operate the system so as to minimize the transmission losses. The SSNISO should itself operate in a manner to reflect optimum economic efficiency and should deal fairly, equitably, and transparently with all the entities in the industry. (d) centralized supply and grid expansion. Until 1991, the power sector was vertically integrated with over 98% generation and over 95% distribution being undertaken by the state-or central government- owned utilities, like the electricity boards. Therefore, the power industry imbibed the inherent shortcomings such as operational inefficiencies, high T&D losses, and over-staffing of a vertically integrated system. The government of Orissa was the first state to initiate the process of restructuring, in the mid-1990s, with the help of a loan from the World Bank (WB). The model of unbundling envisaged: (i) restructuring the state-owned electricity board (SEB) into three separate entities consisting of generation, transmission, and distribution, (ii) generation and distribution to be privatized, and (iii) setting up an independent regulatory authority to monitor and control these players. Following in the footsteps of the Orissa state, various other states, such as Andhra Pradesh, Haryana, Rajasthan, and Uttar Pradesh, have obtained loans from international funding agencies, such as the WB and the Asian Development Bank (ADB), for unbundling their respective SEBs.